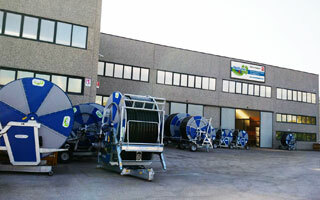 Nettuno manufacturing self-propelled irrigation systems and high quality motor pumps for more than 40 years. Nettuno’s product reliability and versatility is due to using the best components and latest technologies which results in significant energy savings, as well as savings in operating costs. The experience gained across the globe, under diverse and difficult ambient conditions, helps us to satisfy modern day agriculture’s needs, while respecting the environment. Nettuno is a trademark owned by Visa Spa, a leading company specialized in generating set manufacturing and successfully present in the market. Visa SpA, through its trademark Nettuno®, has successfully been present in the water treatment sector for over 40 years, offering self-propelled irrigation systems and high quality motor pumps for agriculture and industry.